Driving redemptions and product education offline through online gamification. Gamification is an addictive hook that can magnify campaign success especially when constructed strategically to include mechanics that drive customer to offline retail stores. For the new product launch, the brand needed to communicate product benefits in targeting dullness, discolouration and product pairing to boost skin radiance in an engaging and less technical manner that would be able to engage women between 25 – 45. Our objective was to drive traffic to the pop-up and hence drive sales for the product launch. Inspired by highly addictive mobile games like Candy Crush, a product-themed multi-level matching game was created on a standalone site to prevent drop outs or barrier to participation for app downloads. Throughout the game, product tips and education were woven into the game tutorial and game play through game matchings encouraging players to make product matching to score higher points which was in line with the real life recommended product usage. 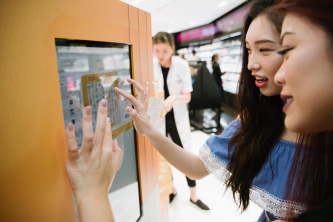 Game participation and continuity was further incentivized through sampling, discounts and prizes, most of which were geared at driving foot traffic to the pop-up store, thereby creating a connected retail experience that helped drive online traffic to the offline pop-up. Customer details were collected at the start of game play for lead generation and LCD screens were set up at the offline pop-up so walk-in customers could experience the game in-store as well, creating an omnichannel customer journey. The campaign collected 3000+ leads and sold out products within the first 2 weeks.